I have so much gratitude for the people included below. Their skillful voices, their dedication to deep research, and the love they pour into these works has me eternally grateful. I hope you are as moved by these stories, recollections, reviews, and reflections as I have been, and I hope they enrich your libraries and nourish your souls the way they have fed mine. More resources will be added soon, so please check back in! Sometimes, not always, I use affiliate links as an additional source of income to support the work that I do, it is at no extra cost to you. For more information, please see my affiliate disclaimer. Thank you for your support. 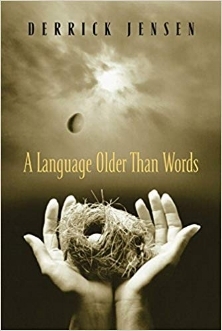 At once a beautifully poetic memoir and an exploration of the various ways we live in the world, A Language Older Than Words explains violence as a pathology that touches every aspect of our lives and indeed affects all aspects of life on Earth. This chronicle of a young man's drive to transcend domestic abuse offers a challenging look at our worldwide sense of community and how we can make things better. Derrick's work is confronting, personal, vulnerable, spiritual, and beyond necessary. His heart is poured into the pages of this work. Thank you, Derrick, for being so willing to share the shadow of your life and the light seeds that were planted within it. You are an inspiration. Mycelium Running is a manual for the mycological rescue of the planet. That’s right: growing more mushrooms may be the best thing we can do to save the environment, and in this groundbreaking text from mushroom expert Paul Stamets, you’ll find out how. The basic science goes like this: Microscopic cells called “mycelium”--the fruit of which are mushrooms--recycle carbon, nitrogen, and other essential elements as they break down plant and animal debris in the creation of rich new soil. What Stamets has discovered is that we can capitalize on mycelium’s digestive power and target it to decompose toxic wastes and pollutants (mycoremediation), catch and reduce silt from streambeds and pathogens from agricultural watersheds (mycofiltration), control insect populations (mycopesticides), and generally enhance the health of our forests and gardens (mycoforestry and myco-gardening). In this comprehensive guide, you’ll find chapters detailing each of these four exciting branches of what Stamets has coined “mycorestoration,” as well as chapters on the medicinal and nutritional properties of mushrooms, inoculation methods, log and stump culture, and species selection for various environmental purposes. Are trees social beings? In this international bestseller, forester and author Peter Wohlleben convincingly makes the case that, yes, the forest is a social network. He draws on groundbreaking scientific discoveries to describe how trees are like human families: tree parents live together with their children, communicate with them, support them as they grow, share nutrients with those who are sick or struggling, and even warn each other of impending dangers. Wohlleben also shares his deep love of woods and forests, explaining the amazing processes of life, death, and regeneration he has observed in his woodland. After learning about the complex life of trees, a walk in the woods will never be the same again. From a philosopher whose magisterial history of Western thought was praised by Joseph Campbell and Huston Smith comes a brilliant new book that traces the connection between cosmic cycles and archetypal patterns of human experience. Drawing on years of research and on thinkers from Plato to Jung, Richard Tarnas explores the planetary correlations of epochal events like the French Revolution, the two world wars, and September 11. Whether read as astrology updated for the quantum age or as a contemporary classic of spirituality, Cosmos and Psyche is a work of immense sophistication, deep learning, and lasting importance.